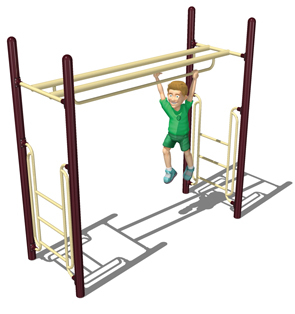 The Double Parallel Bar Horizontal Ladder is a variation on the traditional monkey bars with two elevated horizontal bars instead separate rungs. Improves hand eye coordination while building strength and endurance. Children go across by hand over hand movements on a single bar or hands on both bars. Ladders on both sides allow children to reach the parallel bars and get off on the other side. Designed with safety in mind, these horizontal parallel bars promote safe risk-taking and foster confidence.